As the summer sizzles in Marbella, the heat is being turned up on the teams competing in the Sala Super League – the Coast’s most popular amateur year-long golf competition. 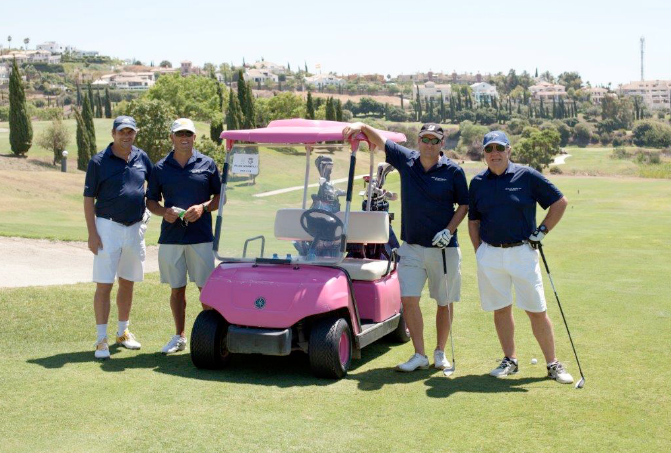 Saturday 2nd August, saw the Sala Super League competition tee-off at Los Flamingos one of three outstanding courses surrounding the magnificent 6 star Villa Padierna Hotel & Resort on the New Golden Mile west of Marbella. The championship course which has hosted several European Seniors Tour Finals and the Spanish Women’s Open, was designed by Antonio García Garrido. Complete with Tuscan style ornamental gardens and fountains, and views to the Mediterranean, playing Los Flamingos, is a golfing experience not to be missed. The occasion in question was the seventh of ten events programmed during La Sala Super League’s successful debut year. With a total of 88 players, the competition was high for the teams to be in the running for a host of attractive prizes. The humorously named “Weapons of Grass Destruction” were the winners this time around for the team prize, while the individual winner Paul Nash triumphed in the individual competition. Although the wind blew strongly and the greens were fast, the players notched up more brilliant Stableford scores. Following a challenging and satisfying morning’s play, the teams made their way to the boutique beach club, La Sala by the sea where the cool blue of the pool and Mediterranean beyond, along with a selection of thirst-quenching drinks and delicious appetizers helped the golfers relax and cool off following their competitive game. In a chilled out mood complete with live sax music, the players enjoyed an informal prize giving ceremony and wind down session while soaking up the relaxed beach club ambience. As Sala Rewards card holders, you can enjoy special offers and discounts of 10 per cent when dining in the evenings at the Thai inspired beach club on the Puerto Banús shoreline. For further information or to make a reservation, please call Tel: 952 81 3882 or 952 814 145, or email reservations@lasalabythesea.com.